Aloha Friday!! It is Friday right, lol. The summer has been a great time for me to relax and spend time with my family, but I have been doing a lot of school work. It's been the fun kind of work though!! This little blog sure got busy last week with my Giveaway and then the Theme Linky party! I have loved looking at everyones ideas, and getting a few more for myself. I almost wanted to change what I was doing!! 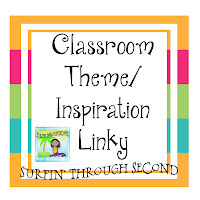 If you haven't linked up please do at any time, I would love to see your classroom! I am going to take a little vacation today away from teaching to bring you a little preview of some of my favorite grinds (food) since I have moved here to Hawaii. When we first moved here from San Francisco I immediately lost 10lbs! In the city you can walk out the door of your house and there is every type of food in the world within walking distance! If I was craving Ben and Jerry's at 10pm, I just walked to the corner store and got it. Well once we moved out to the country I had to get used to everything closing at 6pm and the high price of food! I also had to adjust to some new foods, some that I love and some not so much. So you may remember this picture from one of our tours...Spam Musubi is a favorite for kids and adults, but not one of my faves. I do like them made with Teriyaki Chicken though. Have you ever tried Poke? It is one of my favorite things to eat, especially with seaweed salad. It is Ahi tuna raw, like sashimi, cut into these delectable little chunks. right out of the container with chopsticks. It comes in other varieties too. Limu is seaweed, tako is octopus. If you are a sushi lover then you would love poke. There is a huge Japanese influence in the islands and much of the food reflects that. In my lunch box I usually have a pair of chopsticks, I hardly ever eat with a fork. Bento boxes are popular here for a quick lunch. It usually is some kind of meat and vegetable over rice. a meat lover, you could stop at 7-11 and find these there. 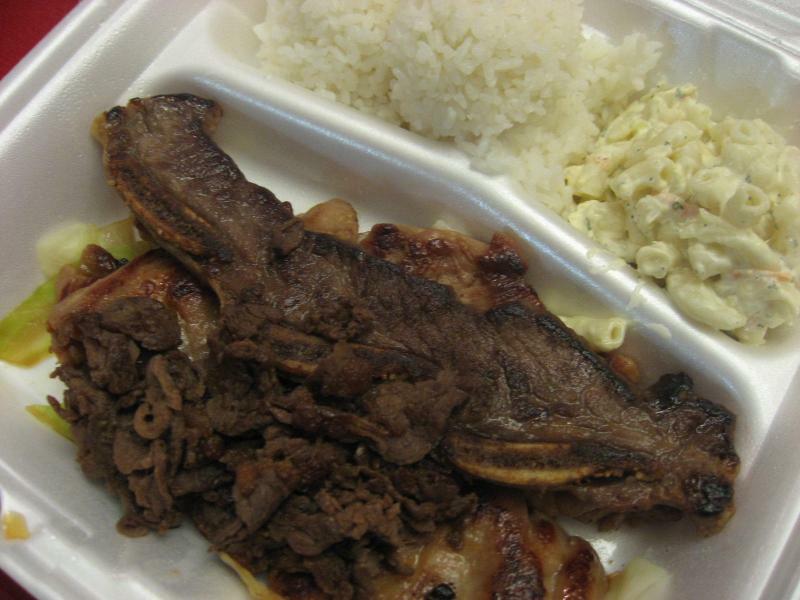 A plate lunch usually consists of a meat, usually fried and greasy, 2 scoops of rice and a side of macaroni salad. seem to rule the roost. You can go to any little local place like L&L Drive In or sometimes you can find a plate lunch truck in certain areas. Have you ever had a LocoMoco? I have NEVER eaten this! Looks like a heart attack on a plate. This one doesn't even have the gravy on it! One of my favorite dishes though is Kalua Pork and Cabbage! Okay so I am not a big meat eater, but I do eat a lot of local fresh fruit, especially when we can just go and pick it from our yard. And of course avocadoes, coconuts, mangoes, guava and tons of other exotic fruits brought here from many places all over the world. These are just a few local favorites that I have shared with you. Honestly we probably eat just like your family, Pasta night, Taco Tuesdays, Pizza, and BBQ. We are lucky we have access to fresh fish especially tuna which is my favorite. Sometimes we get big chunks from friends who have fishing boats. 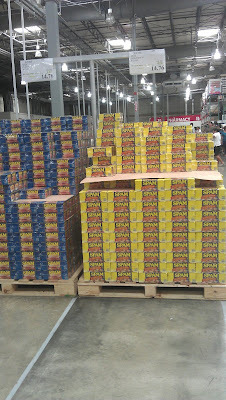 but I bet you don't have this at your Costco! My husband and I went on our honeymoon to Hawaii about 3 weeks ago. We just happened to order poke the first night we were there because it sounded like something he would like. We then found out it was a traditional Hawaiian dish. He's been dying for some more since we got back home. But I can't find any Ahi. I'll have to show him your pictures. Thanks for the sharing. I had some in California once and it just wasn't the same! I would lose a ton of weight. What is there for a Gluten Intolerant/Vegetarian?? 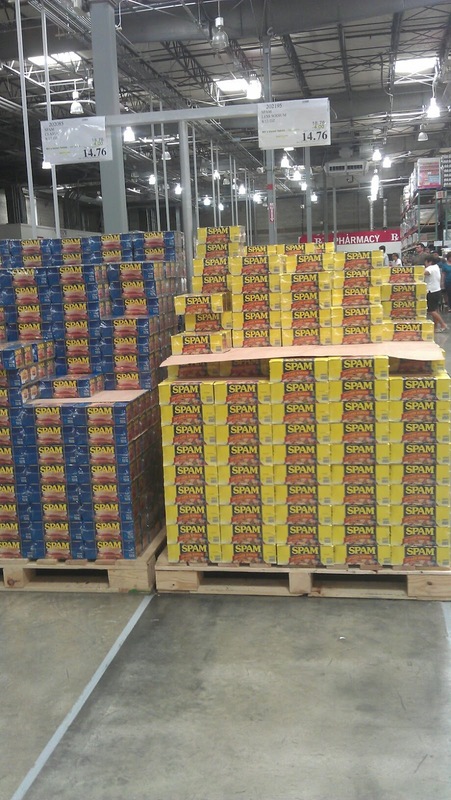 That is a lot of SPAM! Thanks for sharing. I love island life! There are lots of fruits and veggies to choose from! Aren't hot dogs gluten free;)? That Costco picture is so funny. We spent our honeymoon on Maui and I remember seeing spam everywhere. Your yard is amazing! I loved visiting the pineapple plantations and eating that fresh pineapple. That was my addiction on the island. Never tried your favorite desert but I still think about the Hula Pie from Jake's 10 years later. That was a huge slice of heaven. We found their sister restaurant in San Diego, but it just doesn't compare. Lol Catherine, if you saw my yard you would be not say that. It is a horrible jungle out there!! Ha! That Spam photo is hysterical! Nothing like fresh Hawaiian pineapple! Love it! I did not know that Hawaiians loved Spam!! That is so funny! Icould probably live in Spam. My mom used to cook it up for breakfast. I am so envious of you, it must be awesome living in Hawaiia! My son just got back a couple of weeks ago, but I have never been. Maybe someday! Oh you would love it here, lol! There is a great Anthony Bourdain show on Hawaiian food, and he has to eat lots of Spam! I always love when you have pictures of Hawaii on your blog. I've never been but it's on my bucket list for sure! I'm cracking up about the chopsticks--that is something I don't think I'd ever learn how to use properly! Mahalo Terri! Did you find the Price Busters yet? 20% off sale for teachers next week! I didn't realize you moved to Hawaii from the city. I'm from the bay area. As soon as I find a pile of money, we'll move to Hawaii. Was it hard to get your California credential to work there? I'm full of questions, sorry. How do you have a reply option on your comments. I'm new to all this and would love to have that option on my blog. Love you blog! Every time you post I feel like we have more in common. I had no idea Spam was so big over there. My mom made me eat it a few times (in the 70's) and I still remember the taste. The poke looks and sounds delicious! I didn't know you are from The City. I'm in Sonoma, just a few miles north of there. What a cool change from the cold summers in SF, especially this year! I love all of your posts about Hawaii. Thanks for sharing!! It's on my list of places I want to visit someday. How amazing it would be to be able to pick fresh bananas and pineapples from your backyard!!! Super awesome to see all the food! I love learning about new things to eat and how different other people eat. I really am interested in trying poke and that cabbage and pork looks AWESOME. Seriously making me hungry. Monday Made It and a Winner! Monday Made It and A Giveaway! !